One minute you’re holding them in your arms, and the next minute they’re old enough to learn to drive. It can be difficult to let your children start driving, but the sooner you start teaching them the rules of the road, the safer they’ll be in the long run. Here are my top three tips to help ease the fear of teaching your children to drive. 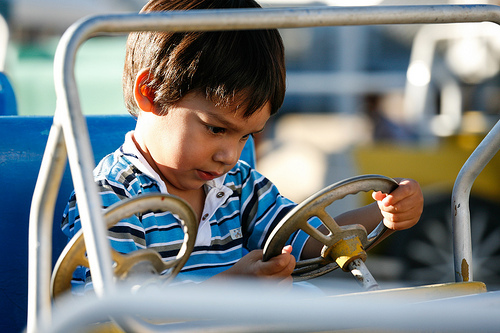 The best teaching happens before your child even puts their hands on the steering wheel. When they’re approaching driving age, teach them to start paying more attention to you when they’re riding along in the car. Have them look in your mirrors when you change lanes to get a better idea of distance and the size of the car, and explain to them what’s happening at different sets of lights so that they’re aware of what to do and what not to do. Another great option is to have your child take the driving practice theory tests at TopTests.co.uk so that they have at least some knowledge of driving laws going in. This also helps them prepare for their driving theory exam, so that they’re more likely to pass it the first time around! Don’t forget to teach them what to do in case of an accident. Even if your kid is a perfect driver chances are they’ll get into a minor accident and they need to know how to handle the situation if they do. Make sure your child is familiar with all the controls on the car before you leave the car park. Show them the left and right indicators, headlights, windshield wipers, and how to defog the windows. It wouldn’t be fun to get caught in the rain while learning to drive, and get in a panic not knowing how to turn the wipers on! Also, be sure to go over the basic dashboard symbols so that if anything goes wrong in the future your child is in a position to remain calm and understand the situation better. After you’ve gone over all the different controls (and practiced them while stopped) then your child can finally begin to drive. So you’ve been through all the practice, and your child has their provisional license. After all of this prep work, your kid is probably impatient to actually start driving, but remember to start small and build up. Begin by having them drive around the neighborhood, getting used to the controls and the feeling of driving the car. Have them pay attention to the little things like coming to a gentle stop and making sure to indicate correctly. Give gentle critique if necessary and provide supervision if they need it, but try not to talk too much so as not to distract them, and avoid playing music while they’re learning. As your child gets better and more confident in their abilities and if you deem it safe, let them practice on busier roads. Have faith in your child’s’ ability to drive; being outwardly nervous will only make them worry, even though they’re older they still look to you to gauge the situation, and if you’re freaking out there’s more of a chance that they will as well. Learning to drive is an exciting and nerve wracking time for both your child and you, but with the right preparations and great teaching your kid can learn to Teaching Your Kids How to Drive be a safe and comfortable driver.